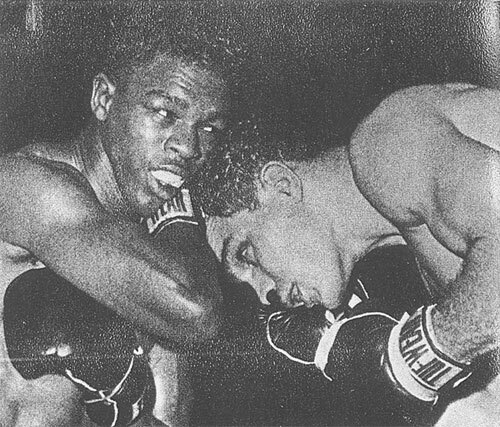 On this day in 1959, Carlos Ortiz scored a thrilling TKO over Len Matthews at 2:21 of the sixth round of their scheduled 10-rounder. The lightweight bout played out before 6,881 spectators at the Arena. Going into the fight with a 16-1-1 (13 KO) record, the young Matthews had captured the imagination of the boxing community with his fast hands and heavy punching style. Even though Ortiz had an edge in experience (28-2 /10 KO), Matthews was the betting favorite. Ortiz jumped out to an early lead in the first two rounds. He landed several quick shots, while Len focused on the body. In the third, Carlos appeared to tire, giving Matthews an opportunity to surge. Len evened the scorecard in rounds three and four with his fast, hard shots and even cut the New Yorker over the eye. But it was a give and take battle. Matthews' face began to swell a bit and blood trickled from his mouth. In the fifth, Ortiz kept busy and flashed his quick jab throughout the session. The next round proved to be the end, as Ortiz suddenly hurt Matthews along the ropes and went in for the kill. Len fought back but a pair of crushing left hooks by Ortiz had Matthews helpless. Referee Pete Pantaleo jumped in to stop it. The fast-paced scuffle was over but it was forged in the memories of all those lucky enough to have watched. The writers of the day called the classic bout "brutal" and "savage". In his next outing, Ortiz won the vacant jr. welterweight title with a second round TKO of Kenny Lane. His career featured much more title play in both the jr. welter and lightweight divisions. He ended with a 61-7-1 (30 KO) record and was elected to the Hall of Fame in 1991. Ortiz often cited this fight with Matthews as his toughest ever. Matthews continued to thrill fans for another five years in the ring. Although he was one of the best young prospects and the ultimate crowd-pleaser, he never did vie for the championship even though he fought his way to the number one contender spot after his bout with Ortiz. He ended his career in 1964 with a record of 42-10-3 with 29 KOs.